Biography of Renaissance Architect, Author of De Sculptura, Della Pittura, De Re Aedificatoria. The Italian architect, painter, sculptor, and writer Leon Battista Alberti was the most important art-theorist of the Early Renaissance. His importance in the arts of painting, sculpture and architecture is mainly due to his three influential treatises on Renaissance art: De Statua and Della Pittura (1435) and De Re Aedificatoria (1452). These theoretical works provided the Florentine Renaissance with it's first scientifically-based foundation of art and art history. Even so, his importance in each of his various roles as a humanist, poet, art theoretician and architect is equally great and impossible to overestimate. This universal scholar of the quattrocento was intimately aquainted with the most important Old Masters, humanists, popes and regents of his time period. 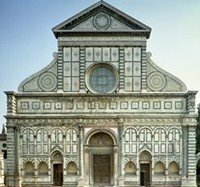 He was influenced in particular by his elder contemporary Filippo Brunelleschi (1377-1446) - for more details of whom, please refer to Florence Cathedral, Brunelleschi and the Renaissance (1420-36). Just how varied his skills were is demonstrated by the commission that Cardinal Prospero Colonna awarded him in 1443 - to salvage a ship that had sunk in Lake Nemi. Although the attempt ultimately failed, in the process Alberti developed a new method of measuring the depth of water. His versatility can only be compared to that of Leonardo da Vinci (1452-1519) and Michelangelo (1475-1564); however, these two lived in a later time and were able to build on Alberti's basic ideas. Leon Battista Alberti was born an illegitimate, but nonetheless recognized, son of one of the most high-ranking and wealthiest Florentine families. He received a comprehensive education, and obtained his doctorate in law at the age of just 24 in Bologna, which at the time was one of the most famous universities in Italy. By the age of 20 he had already written the comedy Philodoxeos; later, he took up the study of mathematics and the natural sciences. Although he also tried his hand at painting and sculpture, he ultimately remained a theoretician. Even in his later work as an architect he contented himself with producing designs and models of various projects, preferring to leave the practical execution of the buildings to others with greater aptitude. After Bologna, Alberti entered minor orders, and became a papal civil servant. He remained in papal service for most of his life; although he lived principally in Rome, his duties took him to a number of Italian cities and possibly as far afield as the Netherlands. Between 1434 and 1436 he was in Florence (which he seems to have regarded as his home, despite his cosmopolitan life) and it is during this period that his interest in visual art first becomes apparent. The undated treatise De Statua (On Sculpture) was probably his first essay in this field. In it, Alberti recommends the sculptor to be guided both by an observation of nature and by academic study, entailing a knowledge of proportional theory. It also contains the first known definition of sculpture as an additive process, as in clay modeling, or a subtractive one, as in carving. His better-known and more ambitious Della Pittura (On Painting) - the first authoritative treatise on Early Renaissance painting - was written in Latin in 1435 and translated into Italian the following year. Divided into three books, it deals with the technicalities of "one-point" linear perspective, the theory of human proportions, composition, and the use of colour, and considers the nature of beauty and art as well as the behavior appropriate to an artist. Alberti defines painting as a "projection of lines and colours onto a surface", and insists that artists have a knowledge of poetry and rhetoric as well as a certain amount of general knowledge so as to be able to render their subjects appropriately. This approach to painting was very innovative, as older treatises, such as that written in about 1390 by Cennino Cennini (active c.1398), tended to concentrate on more practical instructions for the artist. In contrast, Alberti elevates art beyond a mere craft to the level of a science. This reflects the newly developing humanistic approach to art, which Alberti himself embodied as the ideal uomo universale (Renaissance man). Besides his theoretical advice on how to paint and his exhaustive explanation of perspective, Alberti also describes the appropriate criteria for evaluating a painting or other work of art. His fundamental ideas concern drawing contours, structuring a composition, and using colour. (See also the important Renaissance concepts of Disegno and Colorito.) In his opinion, only the harmonious combination of all these factors could lead to a satisfactory result. To achieve this, he advises painters to be diligent in drawing studies from nature. The various parts of the body should correspond to one another in sixe, character, purpose and other qualities; for "if in a picture the head is very large, the chest small, the hands broad, the feet swollen and the body bloated, the composition would be sure to be ugly". Finally, he singles out for praise several contemporary early Renaissance artists, including Donatello, Ghiberti, Luca della Robbia and Masaccio, who, according to Alberti, were in a position to create great works of art again using the new methods of the Renaissance after their long period of decline. As Alberti's dedication to Filippo Brunelleschi and his references to Masaccio (1401-1428), Donatello (1386-1466), Luca Della Robbia (1400-1482), and Lorenzo Ghiberti (1378-1455) imply, the book was a codification of current Florentine artistic practice. In certain respects, particularly in his observations on aerial perspective, Alberti's theory went further and was actually in advance of contemporary practice. His request, at the beginning of Book One, that he be judged as a painter rather than as a mathematician, is the only surviving evidence that Alberti himself painted. Although no surviving works by his hand have been identified, there seems to be little reason to doubt this claim. Alberti seems to have turned to architecture in the 1440s. His treatise De Re Aedificatoria (On Architecture) was completed in 1452. Drawing upon a critical reading of De Architectura by the ancient Roman architect Vitruvius and a first-hand antiquarian knowledge of Classical remains, he put forward the first coherent theory of the use of the five Classical orders of Greek architecture since Antiquity, relating their use to different classes of building. He also expounded a lucid theory of architectural beauty, dependent upon the harmonic relationship between certain fixed proportions, mitigated by ornamental forms. As the first comprehensive treatise on Renaissance architecture, this book is in many respects comparable with the earlier Della Pittura, although it was more a work of original research, and was more influential. See also: Architecture Glossary. By this time Alberti appears to have been employed as a papal consultant on urban planning and the conservation of Classical remains. His first known architectural commission was undertaken about 1450 for Sigismondo Malatesta of Rimini. This prince, who was as steeped in Classical culture as Alberti himself, wished to convert the Gothic church of S.Francesco in Rimini into a splendid mausoleum for himself and his court. Faced with this unprepossessing task, Alberti's solution was both ingenious and simple. Retaining the interior with minor decorative modifications, he enclosed the old fabric within an architectural shell. The facade was recast as a temple front incorporating a triumphal facade motif, and the sides were masked with a massive series of piers, framing deep, round-head niches. The walls were taken up to a sufficient height to conceal the church within. It seems that the crossing was to have been crowned with a huge semi-circular dome, though this was never built. Despite its incomplete state, the church stands as an austere evocation of Roman Antiquity, such as had never before been seen in the quattrocento. Shortly afterwards, Alberti was called upon to complete the facade of the church of S. Maria Novella in Florence (pictured above left). Incorporating the extant Gothic arcading of the lower story, Alberti monumentalized the facade with the addition of a great arched central doorway, and unified it with side pilasters and a high attic zone. As at Rimini, the end result is a triumphal arch motif. In the upper story, he retained the old circular window and surrounded it with a visually dominating square element. Decorated with pilasters and surmounted by a pediment, this formed an applied temple front. The difference in height between this storey and the aisles was effectively masked by a pair of great volutes. At S.Maria Novella, Alberti had formulated a lucidly structured Classical facade, working within the traditional Tuscan formal repertoire dictated by the existing building. The genius of his architectural design is that it appears as a convincing aesthetic whole and in no way as a compromise. Alberti's last two church designs were for new buildings, commissioned by Ludovico Gonzaga of Mantua. The first, S.Sebastiano, was begun in 1460 but never properly completed. It was conceived as a central cube spanned by an enormous domical vault, contained within a Greek cross. Three arms ended in apses, the fourth led out to a pedimented facade with a broken entablature. The main story was elevated upon a crypt, giving a strange emphasis to the facade. This would probably have been masked by a mighty stairway, firmly anchoring the facade to street level, but it was never built. The second church S.Andrea, was begun in 1470 and completed according to Alberti's plans after his death. On a Latin cross plan, the church was enclosed with a great coffered barrel vault. This coffering was echoed in the chapels - that lined the nave, in the entrance porch that serves as a centerpiece to the facade, and in the remarkable window niche that stands high above the majestic main pediment and its giant order. Both churches were of a very unconventional design, although they reveal a deliberate application of proportional theory, and the use of a wide range of antique sources, closely related to the theories in De Re Aedificatiora. In addition to these works, Alberti designed the Palazzo Rucellai and the tiny shrine of the Holy Sepulchre (Rucellai Chapel) in the adjoining church of S.Pancrazio. His total oeuvre is small, but highly significant. With his unparalleled knowledge of antique architecture, Alberti set out to transcend his models. In addition, he also practised as a sculptor and painter. No pictures by him have survived, but two bronze plaques (self-portraits) are attributed to him. One is in the Louvre, the other in the National Gallery Washington DC. They are dated to the mid-1430s. In his architectural designs, and in the literary explanation of his aims and ideas, Alberti provided a secure basis for the subsequent development of the classical style in European architecture. When his other literary works, in particular his treatises on sculpture and painting, are added to this achievement, his contribution to the Renaissance in Florence and elsewhere is immense.